Discussion in 'Music Discussion' started by Confeos, Jan 31, 2019. If one were to use the search function on these forums and type in "Rainbow", generally speaking, three kinds of posts or threads would come up: a) people agreeing that the first three albums with Dio behind the mic are full of awesomeness, b) people denying any sort of interest in Rainbow post-Dio, and c) people lamenting how Blackmore later decided to go full medieval and leave the rock genre that he contributed so much to behind, seemingly forever. Adressing these, I of course wholeheartedly agree with the first kind. But I couldn't wrap my head around the second, until I realised that I might be in a minority when I say that my interest and excitement for Rainbow's music first of all is due to the presence of Ritchie Blackmore. To me, he is one of my biggest musical heroes - fully on height with Dave Murray, Bruce Dickinson and Phil Lynott. There's no doubt that the Blackmore/Dio-combination was absolutely deadly and produced some of the very best moments in the entire history of rock (my opinion of course), but I firmly believe there's gold to be found on every Rainbow record, despite them going in a direction more like AOR after Dio's departure. So, seeing as there is a current trend of reviewing entire discographies (which I think is awesome) of people's favourite bands, I'm going to do the same for Rainbow. I imagine the first three records with Dio could spark a few proper discussions, but whether or not this will be case for the later albums, I most certainly will provide my own thoughts on each of them. Oh, and just in case there are anyone here who don't know what the hell I'm talking about: Rainbow was formed by guitarist Ritchie Blackmore after he left Deep Purple around 1974-75. They released seven studio albums and two live albums between '75 and '83 with three different singers, before Deep Purple reformed in 1984. Blackmore left Purple for good in '93, made one more album with Rainbow (with a fourth singer), and then abandoned rock altogether to play renaissance-inspired folk music with his wife. In recent years he has been playing a few concerts under the Rainbow-banner with yet another new lineup (and a fifth singer), and has teased that they might record some new material. Nothing has happened yet, but one can only hope. Man on the Silver Mountain - The band's debut album may only bear Ritchie Blackmore's name, but Blackmore himself has said that in hindsight, Ritchie Blackmore and Ronnie James Dio's Rainbow would've been a more accurate title. "Man on the Silver Mountain" proves this and contains all the classic elements that Blackmore and Dio stood for: an amazing riff, fantasy-inspired lyrics by Dio (and I believe one of the first songs where he's critical of religion) and neo-classical melodies, chord progressions and a great solo. It was played in concert often after Dio left, and Dio himself usually featured the song in his solo setlists as well, which only emphasizes its strength and status. I find it hard to point out anything I'm not digging, but I do think the drums are a bit bland - Cozy Powell would do wonders later on. Still, it's an easy 10/10. Self Portrait - A bluesier riff leads into a midpaced track with yet another amazing Dio-performance. The verses are a highlight for me here; they groove along nicely with some sweet but subtle guitar melodies. The guitar solo reminds me of some Deep Purple-track, but I can't make out which one. My only complaint is that it's too short; they could easily have fitted an organ solo in there too. 8/10. Black Sheep of the Family - So, this is the song that started the whole collaboration between Blackmore and Dio - the former wanted to record and release the track (a cover of a band called Quatermass) as a solo single, but ended up being so pleased with it that an entire album was written in short notice. Really, it's nothing special, and I can't stress how glad I am that the project expanded! I like the middle part of the song - it's a bit moodier than the rest of the tune, which sounds overly happy at times. Credit to Dio for still sounding great on a silly song. 6/10. Catch the Rainbow - Oh man, this is all pleasure for the ears. I do hear the similarities to "Little Wing", but "Catch the Rainbow" is far superior in my opinion. This one has beautiful verses, an absolutely gorgeous chorus, and once again nails that fantasy-feel - when I close my eyes I'm standing on one of the balconies of the castle on the cover, slowly watching the sun rise. Blackmore's solo is full of feeling and the fade-out ending is incredibly atmospheric. It can't be anything but a 10/10. Snake Charmer - This is definitely my least favourite song here. The intro is strange and almost messy, and the I'm not a fan of the verses. The pre-chorus is a bit better, but the chorus itself is a letdown. The track is saved by what is probably Blackmore's best solo on the debut, complete with a few harmonic minor phrases, and that alone is enough to give it a 6/10. The Temple of the King - From the worst to the best song, this is simply amazing - a mellow, acoustic piece with both Dio and Blackmore at their very best. The subtle arpeggios in the chorus sends shivers down my spine, and Dio gives what could be his best performance on the entire album. Lyrically, it's like a continuation (or perhaps prequel?) of "Man on the Silver Mountain" - it seems to be about finding one's place in this, or whatever world Dio's fantasy tales take place in. By any means, this is a perfect song. Flawless. 10/10. If You Don't Like Rock and Roll - Yes, this might seem out of place when surrounded by sword and sorcery-songs, and honestly it does suffer from a happy sound just like "Black Sheep of the Family". But I can't help but like this a lot better than the former; it's simple rock n' roll, and simple, good fun. As a side note, it's also the first and only time we get an actual piano solo on the album. I believe a 7/10 is fair. Sixteenth Century Greensleeves - Taking less of a fantasy-approach than some of the other songs, this feels more like a battle hymn, sung by an army ready to storm a castle, overthrow the tyrannical lord and claim his riches (and perhaps a fair maiden or two!). Musically, this is every bit as brilliant as the lyrics: a great but fairly simple riff and another blinding solo by Blackmore. My only complaint is that the "meet me when the sun is in the western sky"-part is sung only once - it could easily have been repeated after the solo before heading into the final verse (something they used to do when performing the song live). It's still easily a 10/10. Still I'm Sad - The album's second cover, this time an instrumental version of the classic Yardbirds song. As a result, Blackmore is able to take the center stage and whip out some amazing licks. Rhythmically, it's very busy and similar to the Deep Purple track "You Fool No One", but it still manages to be very atmospheric - the female voice that enters in the second half of the song is gorgeous and gives me goosebumps every time. It's not perfect, but it's damn close, and a great end to an amazing debut album. 9/10. So, there we go: the first Rainbow album! The band isn't out in full force yet, despite both Blackmore and Dio firing on all cylinders, but with Blackmore letting the rest of the musicians go shortly after the recording, the stage was set for the likes of Cozy Powell to join for the next adventure. I have a lot of trouble deciding between this one and Rising as my favourite record from the band, so I'm looking forward to going through that one next. MrKnickerbocker, Cornfed Hick and mckindog like this. Nicely written and very much in line with my personal feelings. I'm gonna be following this. Rainbow is another of those bands where I've heard some songs from and I quite like them, but due to my gigantic list of albums to play, I never heard one from them in full. But I'm partial to both Dio-era and non-Dio stuff. In fact, "Street of Dreams" is probably one of my favorite songs of all time. So thanks for the nice write-up! Maybe I'll do some from the band for the 365 albums thing. Confeos and The Dissident like this. Looking forward to your reviews of the subsequent albums, I’m a big Rainbow fan, not only their Dio stuff but through the Bonnet and Turner eras and the much overlooked Doogie White album. With regards to the first album, I think it is definitely the weaker of the three Dio fronted and for me has a fair bit of filler on it, Black Sheep, Self Portrait, Snake Charmer & Catch the Rainbow, don’t really do much for me. While for Still I’m Sad I do prefer the later version with vocals. But Man on the Silver Mountain and The Temple of the King are, for my money, stone cold classics and it is worth owning the album for those alone. In fact, "Street of Dreams" is probably one of my favorite songs of all time.. I agree completely that Stranger in Us All deserves much more recognition. It's the missing link between the fantasy- and AOR-eras, and Doogie White does a masterful job on it. I'd only call "Black Sheep" and "Snake Charmer" proper filler on the debut. Off the top of my head, I'd pick Long Live Rock 'n' Roll is the weakest of the Dio-trilogy. That's not saying much, obviously, because it's still brilliant, and has two of my absolute favourite Rainbow-songs ("Kill the King" and "Gates of Babylon") and some forgotten gems ("Lady of the Lake" and "Rainbow Eyes"). Yes, good idea. And also about time that post-Dio Rainbow gets some exposure on these forums! Cool. When I was a teen (pre-Internet as we know it), I had vaguely heard of Rainbow, but didn't have much opportunity to learn more about them. I bought Bent Out Of Shape on a flyer, and while it was fine, I didn't really understand why Rainbow was considered a big deal. It wasn't until much later that I discovered the Dio-era stuff, which of course I liked a lot better. I have all the Dio-era albums but my exposure to the other stuff is limited to the Bent album I bought in the 1980s and the Catch The Rainbow 2-CD anthology (which I highly recommend, as it is the best-sounding version of those Dio-era songs). So this should be fun. Nice work, and long overdue. Personally, I've always had a soft spot for 80's Rainbow. I'm on board with everyone who says Dio-era Rainbow is the revelation to end all revelations, but I really like the later stuff a lot. However, by the last album you could tell that it wasn't really going anywhere further, and it was a good decision of Blackmore's to end the band. I like later Rainbow but not enough to commit to a full survivor, which is what the topic was last time this came up. A discography discussion is great though and I’ll definitely be following this. I quite like Rainbow post-Dio. OK, nothing matches Rainbow Rising, but there are some fantastic songs on the albums they did with Graham Bonnet, Joe Lynn Turner, and Doogie White. Furthermore, Ritchie Blackmore sporting a dodgy wig playing the lute with his better half is more interesting than most music being produced by most people. In recent years he has been playing a few concerts under the Rainbow-banner with yet another new lineup (and a fifth singer), and has teased that they might record some new material. Nothing has happened yet, but one can only hope. That has already happened, hasn't it? @Perun and @Mosh, I admit the first post was written rather tongue-in-cheek, and not directed at anyone specific I fully understand if the later albums aren't everyone's cup of tea. The suggestion about doing a Rainbow survivor only came after I had decided to go through the full discography myself, so this isn't to be taken as a reaction against that at all. Feel free to chip in whenever as we go along! Right at the bottom if you ask me. The band isn't out in full force yet, despite both Blackmore and Dio firing on all cylinders, but with Blackmore letting the rest of the musicians go shortly after the recording, the stage was set for the likes of Cozy Powell to join for the next adventure. It's worth noting that the entire rest of the band on this first Rainbow album is literally Dio's previous band Elf (keyboard/bass/drums). If you've heard the Elf albums, songs like Black Sheep and If You Don't Like Rock N Roll start to make a lot more sense! I know they're not given writing credits on anything, but who knows what actually transpired during the writing process. 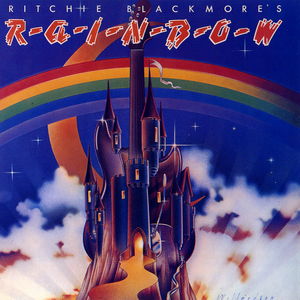 The band's debut album may only bear Ritchie Blackmore's name, but Blackmore himself has said that in hindsight, Ritchie Blackmore and Ronnie James Dio's Rainbow would've been a more accurate title. Considering the make up of the band members and Dio's known confidence/ego, it's shocking that he allowed this album to be released with only Blackmore's name on it. Technically, it could be called "Elf & Ritchie Blackmore" and it would make a lot more sense. I'm not really familiar with Elf - does that mean that before Rainbow, Dio wasn't fully immersed in his fantasy universe yet? Tarot Woman - Rainbow's second album kicks off with the one thing I really miss from the debut: some virtuosic keyboard playing! A nice solo by newcomer Tony Carey sets the mood perfectly; it's spacy and mystical, and the guitars that slowly rise with the rest of the band coming in soon after, is one of my favourite moments ever captured on record. The overall sound seems to have improved a bit from the debut as well - Dio's voice soars like a dragon breathing its fire and flames over the rest of the band. And of course, the song wouldn't be complete without another blistering solo by Blackmore. As an opener, "Tarot Woman" is nothing but perfect. 10/10. Run With the Wolf - This song feels like walking into a Transylvanian tavern one evening, except that instead of the usual folk orchestra, Rainbow's playing in the corner. Dio's singing of wolves howling and evil stuff happening in the night - can you resist, or is the call of the wild too strong? Not that it's too safe inside either, as both Dio and Blackmore once again deliver performances that can easily slay the unwary. I think the premise of this song is amazing, but it falls just a bit short of delivering completely. I'm gonna go with 8/10. Starstruck - The intro is Blackmore at his very best, as he starts with a rising flurry of notes before launching into a straightforward, driving riff. This song might be catchiest one on the record - I often find myself humming the chorus out of nowhere. It sounds like Blackmore's playing a bit around with a slide in the solo, which isn't bad, but not amazing either. I think the weakest point here is the lyrics, but the raw energy of the music makes up for it. Another 8/10. Do You Close Your Eyes - Rounding off the first side of vinyl is the only song that I don't care too much for on the album. The riff is good, and once again the energy is high courtesy of Cozy Powell's performance, but the tune itself doesn't really go anywhere. The verses are great, the pre-chorus is fine, and the chorus is average. Still, being the weakest song on an album of this caliber isn't that bad at all. I think a fair score would be 7/10. Stargazer - Colossal. Monumental. "Stargazer" rises like a tower (pun intended) above the rest of the album, connecting the Earth to the heavens and feeding pure divine energy to our five musicians. Pages and pages have been written through the years, about this masterpiece of a tale about a wizard and his quest to fly into the sky, and I doubt I can come up with anything that hasn't already been praised about the song. Instead, I'll share a personal anecdote: years ago, I played the track to a friend who's never really been into metal or rock in any way. Afterwards, he looked at me and said "THIS is what every singer in the world should aim for". Boy, he couldn't be more right. Dio's performance is out of this world - so is Blackmore's (his solo is probably his all-time finest) and Powell's too, by the way. And the keyboards and bass of course do their parts perfectly in filling out the rest of the soundscape. The power, the emotion and the whole atmosphere of might and magic should warrant this song an 11/10, but since it's not possible, it's of course 10/10. A Light in the Black - From one 8-minute track to another, "A Light in the Black" is lyrically a continuation of the story in "Stargazer": now the slaves who built the tower are searching for a new purpose in life after the death of their master. I once read that Cozy Powell preferred doing all the songs on the album in one take, so listening to how he holds up the energy all the way through is enough to make me feel sweaty myself! Whereas "Stargazer" is only Blackmore soloing, this one has both Blackmore and Tony Carey trading leads and harmonizing with each other throughout, performing some of their absolute best work. The song is close to being perfect, but in my opinion, it doesn't quite manage to build up an atmosphere similar to its predecessor (a monumental task, indeed), but it's a worthy sequel and closer to an album that still shines like the brightest star (is it far?). 9/10. Well, the average rating here is higher than the debut's, so it would seem like I prefer Rising after all. No real surprises there! Rainbow's second release, with a new lineup behind Dio and Blackmore, saw the band reach heights that some would argue they never really came back to again. In my opinion, it's a near-perfect album; two flawless songs, one very close, two very good ones and one almost-filler in "Do You Close Your Eyes" - even though one could argue that it seems contradictoray for an album with only 6 songs in total to have any filler at all. 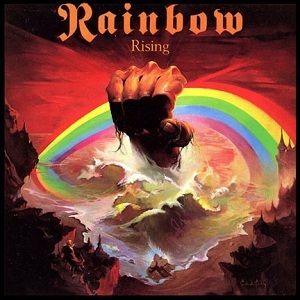 In any case, with this album Rainbow was rising indeed, and no matter what one may think about their later career, this album has never fallen, unlike the doomed wizard in "Stargazer". May it never do so.